Our flagship 5 a day Ready Peck Seed Feeder Mix is built around 5 key ingredients; suet, oats, seeds, nuts, and insects. We have also developed mixes specially for Robins and Finches which have particular feed and feeder requirements. 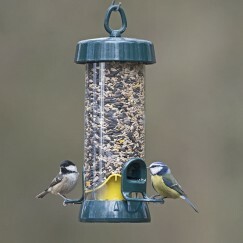 We only supply bird seed mixes that we use here on the farm to feed our own birds. That way we know we're providing the best quality mixes possible that are loved by the wide range of birds we see here in Bedfordshire.